Tennis is a video game released for the Nintendo Entertainment System in 1984. The concept of the game is very basic in that the player controls one person faced against an opponent CPU player. This game uses the same scoring system as "real-life" tennis. The game also features a doubles (2-player) option. The opponent CPU player can be set at 5 difficulties. 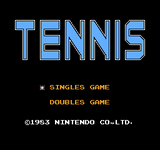 In 1985, Tennis was released for the Japan-only NEC PC-8801 by Hudson Soft. In 1989, the game was re-released for the Game Boy, and again in 2002 for the e-Reader and in the Nintendo GameCube game, Animal Crossing. It also appeared in WarioWare: Twisted! as one of 9-Volt's games. It is also available on the Wii's Virtual Console. Apart from other Nintendo first party tennis games, such as Mario Tennis (Nintendo 64) and Mario Power Tennis (Nintendo GameCube), this game had much more realistic physics. For instance, players could accidentally hit the ball out of the court. In the other games, the power was purposefully limited and the ball would almost always stay in the court. In a self-referential manner typical of Nintendo, Mario is the referee. Source: Wikipedia, "Tennis (video game)", available under the CC-BY-SA License.